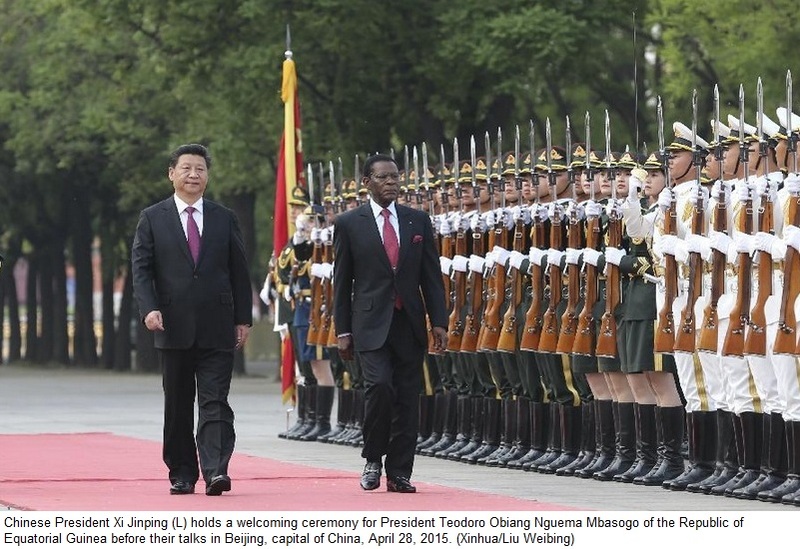 BEIJING- Chinese President Xi Jinping held talks with Equatorial Guinea’s President Teodoro Obiang Nguema Mbasogo on Tuesday and they pledged to lift the bilateral relationship to an all-round partnership featuring equality, mutual trust and win-win cooperation. Lauding Obiang as a good friend of the Chinese people, Xi said the friendship between the two nations has become stronger and is deeply rooted in the hearts of their peoples. Xi said China will work together with Equatorial Guinea to turn their traditional friendship into a driving force for their common development and to further advance the relationship. In addition, he suggested the two sides continue supporting each other on their core interests and issues of major concern, maintain the momentum of high-level interactions and boost cooperation in various fields and on various levels. China will encourage Chinese enterprises in advantageous sectors with good-quality capacity to invest in Equatorial Guinea, assisting the African country with infrastructure construction, Xi told the visiting president. Xi said China will also encourage financial institutions to provide Equatorial Guinea with financial support. Besides, Xi looked forward to closer cooperation between the two countries on education, culture, medical care, sport and mass media as well as communication in regional and global affairs, including the Post-2015 Development Agenda, and peace and development in Africa. Echoing Xi’s view on ties, Obiang said he appreciates China for the long-lasting assistance for Equatorial Guinea, which he said had strongly pushed the socio-economic development of the African country. Obiang hoped for closer cooperation between the two countries and looked forward to China playing a bigger role in international affairs. Briefing Obiang on a the Asian-African summit in Indonesia, where participants reviewed the Ten Principles of Bandung for International Affairs, Xi said China has always backed African countries’ push for independence, peace, stability and development, and that the boosting of friendly cooperation with African countries is a cornerstone of China’s foreign policy. “China and Africa have always been a community of common destiny,” said the Chinese president, adding that closer China-Africa cooperation is in the interests of both sides. As this year marks the 15th anniversary of the Forum on China-Africa Cooperation, Xi said China will make joint efforts with African countries to blueprint cooperation for the coming years. Obiang said African countries still faced great challenges in maintaining stability and promoting development there. Obiang thanked the Chinese side for aiding African countries with no political strings attached, which he said was of vital significance for development. After the talks, a joint statement was issued on establishing the comprehensive partnership of cooperation. Xi and Obiang also witnessed the signing of a series of cooperation documents on diplomacy, education, technology, trade, aviation and finance. Prior to the talks at the Great Hall of the People, Xi held a red-carpet ceremony to welcome the Equatorial Guinea president, who is making a state visit to China from April 27 to May 1, 2015.